A couple of months ago my nearly-nine-year-old son went from being a strictly shorts in summer and trackies in winter boy to wanting to wear jeans all of the time. That’s no problem in theory. However in practice, finding jeans for my son who is nearly as tall as me but as skinny as a rake with no bottom whatsoever and legs like matchsticks is really, really difficult. For kids that are tall and lean, finding pants that fit is tricky. If you go for the right length, they generally have to be belted too much at the waist. If you choose pants that fit around the waist, they are way too short in the leg. A couple of years ago I discovered Daddy Long Legs, pants made for tall, lean boys and urged designer Karen Garton to include jeans in her collection. So I’m very excited to announce that Daddy Long Legs’ denim is here! Garton has created the perfect pair of jeans – the fabric is thick but soft, in a broadly appealing dark washed denim and the style is simple and straight-cut through the seat (no more baggy bottoms!). 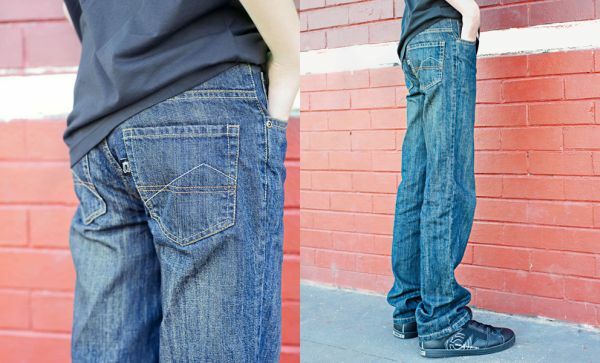 The jeans are also about fifteen centimetres longer than the equivalent size in ordinary pants. Here’s the best bit – it’s a normal waistband. Might not sound exciting to some but after years of pulling in those wretched ‘adjustable waist’ elastics to the tightest they will go, my son is very happy about a waistband without ‘extras’. Daddy Long Legs also stocks cargo pants, carpenter pants, tracksuit pants and grey school trousers. Jeans begin at just $32.95 and are available in sizes six to fourteen. I can hear parents of tall boys with cold ankles clicking over to Daddy Long Legs already!